Most Americans take freedom for granted. Too often, the word is much like a cliché. Most of us have never had to fight for it, or for that matter, even lost a single night's sleep to enjoy its benefits. Azerbaijanis, however, are just now beginning to discover the fine nuances of what "freedom" actually means. It's not something they take for granted, after having to dig themselves out from under 70 years of Soviet oppression since the collapse of the Soviet Union in 1991. History shows that when a nation gains its freedom, there is often confusion, disorientation and even a yearning to return to the "good old days" when life was more secure and daily patterns, more predictable. One of Azerbaijan's most profound writers, Rustam Ibrahimbeyov, once wrote a play about a lion who didn't want to move out of his cage even though he was free to do so. Right: Lenin's statue used to be the prominent feature of the Ministry Building in Baku. Since independence in 1991, it has been dismantled. Since I came to Azerbaijan in 1992, I've seen a wide range of attitudes towards freedom-"istiglal." The first time I ever witnessed any commemoration of this newly-gained independence was October 9, 1992. It was the celebration of the establishment of the Azerbaijan army. At the time, I was living in the suburbs of Baku. I remember taking the Metro to the center of the city that morning, having no idea that anything was going on. But when I came up from the underground tunnels into daylight, I saw streets filled with tanks and military personnel carriers. My heart skipped a beat or two, you can be sure! What was going on? Had the military taken over? Left: Official flags of the 15 Soviet Republics of the USSR. 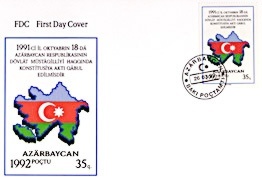 Right: First Day Cover commemorating Azerbaijan's independence. In those days, I used to always carry my camera, so I joined the crowds making their way toward May 28 Street. Although the street was under construction, streams of people were climbing over barricades to get nearer Azadlig Square. The area itself had been blocked off, surrounded by military personnel. I found myself pushed along in the crowd until we reached the barriers. Everybody wanted to get a view--of what, we weren't sure. Suddenly, the barriers were pulled back and thousands of people, including this American, leaped over whatever happened to be in our way and moved, en masse, to the center of the square. There, I positioned myself against a huge tank and started taking photos. Being blonde haired, it wasn't long before some of the soldiers noticed me. But instead of issuing threats, they escorted me to the front of the crowd where I had an even better view of the proceedings. "How ironic," I thought. "Twenty years earlier, my uncle had been arrested in Russia for doing exactly the same thing. But this time, I'm 'shooting' freely and the soldiers are even helping me." Overhead, fighter jets swooped down in formation over the Boulevard. Parachutists dropped into the center of the square. Ten-story banners, marking the date­-October 9­-were draped from the facades of the nearby Azerbaijan and Absheron Hotels. Tanks rolled, and military personnel from all branches of the armed services marched in procession. Leaders waved from their limousines, heroes were applauded, and tens of thousands of people looked on, in pride. This date has now become a national holiday, known as National Army and Navy Day. Unfortunately, independence comes with a price, and soon these military forces were off defending the loss of Nagorno Karabakh, a mountainous enclave inside Azerbaijan populated mostly by Armenians. The following month marked another celebration--the first anniversary of the establishment of the Republic of Azerbaijan of November 19, 1991. It wasn't the first time that Azerbaijanis had experienced independence. Back in 1918, they had established the first Democratic Republic of Azerbaijan. Unfortunately, their experiment was short­lived, crushed 23 months later when Soviet Bolshevik troops moved in and conquered Baku in 1920. The Soviets would retain their chokehold on Azerbaijan's independence for the next 70 years. So many places have new names--streets, squares, parks, metro stations and buildings. With independence, the name "May 28" began to appear, marking the date of the first Democratic Republic of Azerbaijan in 1918. It often replaced the name "April 26," when the Bolsheviks brought an end to Azerbaijan's independence and imposed Soviet rule in 1920. I remember when the monument to Bolshevik heroes in the "Park of the 26 Baku Commissars" was being dismantled and the rubble carted away. The eternal flame has long been extinguished. Not a single flower marks the spot to honor their memory. Names associated with Soviet leaders, or those associated with Russians or Armenians, were among the first to be changed. The statue commemorating Kirov, the Bolshevik commander who captured Baku in 1920, and which had once held the most prominent view overlooking the city, had already been dismantled before I arrived in 1992. Lenin's statue, once standing so prominently in front of the Ministry building, is gone. His name, so omnipresent for streets, museums, squares and assembly halls, has since been replaced with names embracing concepts like "Freedom" (Azadlig) and "Republican" (Respublica). "Communist" Street in Baku was renamed "Independence" (Istiglaliyat) Street. Streets named after Soviet heroes have been replaced with Azerbaijani cultural heroes--especially poets and musicians, even oil barons! But what about the inner thoughts of people? What was going on in their hearts and minds? How had these enormous changes affected their identities and their lives on a practical, day-to-day basis? Of course, many members of the older generations who had grown up under the cradle-to-grave Soviet welfare system, complained that life had been much better prior to independence. The state had taken care of them all of their lives. As there had not been many incentives for the masses to elevate their status, it was often much better to live life anonymously and unnoticed. Drawing attention to yourself often created complications. But suddenly, in 1991, a whole new world was emerging and people began questioning their identity. Overnight, they lost their identity as part of a world superpower that stretched across a vast territory of 11 time zones. Azerbaijanis had to redefine themselves as a tiny, fledgling nation. They felt abandoned, lonely and vulnerable. They had to find new means for earning a living. There were no more state jobs at state-run institutions, factories and stores. Many times, I remember seeing street vendors setting up little wooden crates to sell a few boxes of matches, some toothbrushes and socks, only to have the police come and chase them away. Pensioners were reduced to standing on the streets for hours, holding the last six silver spoons of their grandmother's keepsakes, trying to exchange them for a few rubles, just to stay alive. Family heirlooms could be purchased "for a song." Antiques and carpets were exchanged for food. There were long queues for bread-long, tiresome, quarrelsome queues. And people began to grumble, "Independence-for what? From what?" Independence has brought economic pressure on people to support their immediate, as well as their extended families, some of whom were refugees who had no independent source of income or earning potential. Independence has introduced new laws, not always understood and new cultural influences not always welcomed. Independence has also provided limitless commercial imports never seen before, and for most people, still unaffordable. Independence has imposed career changes, not always for the better. Consider the nuclear physicist who spent his entire life accumulating knowledge and who's now reduced to driving a taxi as he no longer has a job. Independence has offered the chance to earn more money to bring the world a little closer, through satellite TV or foreign radio stations. It used to be nearly impossible to exchange dollars legally into the local currency, which at the time was rubles. Now, dollars are flaunted everywhere. I'll never forget the first time I saw a Volvo being driven on Baku streets. That was only six years ago. Now, streets are jammed with foreign cars, driven by adventurous, often inexperienced, drivers. And what of the Azeri soul? Do people feel more free today than they did seven years ago, 20 years ago? What does freedom mean to the average person? I asked a number of people for their opinions. Natalia: I think real freedom isn't something on the outside, something external. It's something on the inside--freedom of the soul. Svetlana: Freedom means balancing rights with responsibilities. Ulvia: Freedom is the opportunity to choose despite the pressure of other peoples' opinions. Freedom means being responsible for making decisions myself. Freedom is security. If I can't protect myself, am I really free? Fear and insecurity create many complexes which rob you of choice. Aygun: For me, freedom means being able to move outside my culture or the opinions of my family or of others, including self-analysis and self-criticism. Nina: Freedom is space without borders, but which provides a foundation under my feet. Irada: I'm sure that without inner personal freedom, there is no way to build a free society. Indeed, everyone agreed that freedom and independence started from within each individual, and only then could it extend to the larger arena of society.